JT Daniels—the nation's No. 1 quarterback prospect and incoming USC freshman—led the undefeated Monarchs to their first state title in 18 years while passing for over 4,000 yards and 52 touchdowns as a junior to make Gatorade Awards history. The thing about being the best high school quarterback in the country is, if you’re JT Daniels, you don’t want to stay the best high school quarterback in the country for very long. Nearly a year ago, on the eve of his junior season at Santa Ana, Calif., prep football powerhouse Mater Dei, JT was asked by a reporter if the rumors that he would reclassify and enter college a year early were true. JT laughed it off. He’d never considered it, had never even really known such a thing was possible. But over the next few weeks he turned the idea over in his mind and its appeal grew. He had already spent two years excelling in Southern California’s vaunted Trinity League; how much better would he get by doing it for two more? 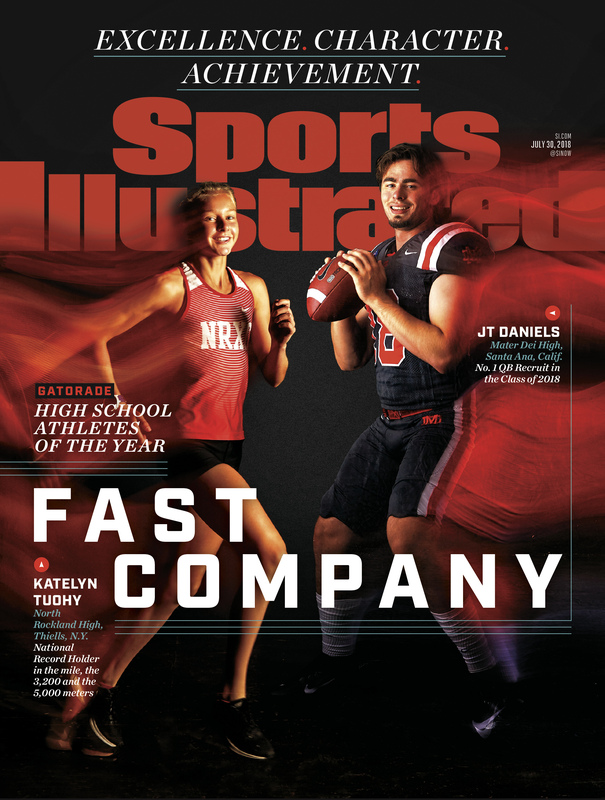 Which is why, as JT becomes the first male to be named Gatorade National Player of the Year after his junior year of high school, he has already been enrolled at USC for more than a month. Seven months after passing for 4,123 yards and 52 touchdowns while leading the undefeated Monarchs to their first state title in 18 years, JT is the likely successor to Sam Darnold, whom the Jets drafted No. 3 overall last April. The unanimous choice among the major recruiting services as the No. 1 quarterback prospect in the nation, 18-year-old JT Daniels is poised to take the helm of a likely Top 25 team in September. A football natural to be sure, JT did not always love the game. He still remembers resenting it when his dad, Steve, tuned the TV to a Detroit Lions game instead of a Thomas the Tank Engine show. But once JT tried football at age five, he was hooked. Early forays as a running back gave way to time at quarterback, and he took the new role to heart. According to Daniels family lore, after JT heard a TV analyst explain that a quarterback can detect man or zone coverage by sending a receiver in motion, he began doing that before every snap while playing Madden. He was in first grade. JT showed exceptional talent in the three-dimensional game too, so when he was 12, Steve took a hiatus from his job in telecom sales to take JT to 7-on-7 camps around the country, traveling to Texas, Illinois and Ohio to face higher-level defenses manned by college-bound athletes. At 15, JT started working with passing guru Adam Dedeaux, whose clients have included Tom Brady, Drew Brees and Carson Wentz. He also trained with former UTEP, Bengals and Titans quarterback Jordan Palmer. On their first day together, JT asked Palmer to recommend two books on leadership. Within a week he had read them both. So, with JT now 6' 2" and 205 pounds, it’s little surprise that those who knew him best agreed there was little development left to do at the high school level. Five games into last season, JT—who had committed to USC during the summer of 2017—and his parents sat down with Rollinson to explain that it would be his last fall on the team, as he would be reclassifying to the class of 2018 and graduating in May. Rollinson had never heard of a player doing such a thing. He certainly didn’t want his star passer to be the first. “My initial reaction was the heat came up the back of my neck,” Rollinson says. “I was being selfish.” But the coach was soon on board, under one condition: that JT not make his decision public until after the season. JT kept his promise and lit up the Trinity League again, breaking Matt Barkley’s school and Orange County record for career passing yards (12,014) and helping Mater Dei win California’s CIF state championship. Shortly after, JT released a slick video on Twitter announcing that he would head to USC a year early. Then the real work began: a 10-class spring semester at Mater Dei, with seven courses taken at school and three at home, including three religion courses and two in English. The Trojans may be counting on JT’s skills as a quick study. USC coach Clay Helton, who was less-than-enthused about the play of his returning quarterbacks during spring ball, has said that JT will “be given the opportunity to compete early.” Expectations for the team are high, given JT’s record and a defense with 10 veterans returning. But those who know JT best don’t expect the pressure to get to him.